Inspired by Autumnal Cornish breaks, this scene shows a literal and symbolic retreat from the city. Patrick Atkins is an artist and illustrator based in Bristol, UK. 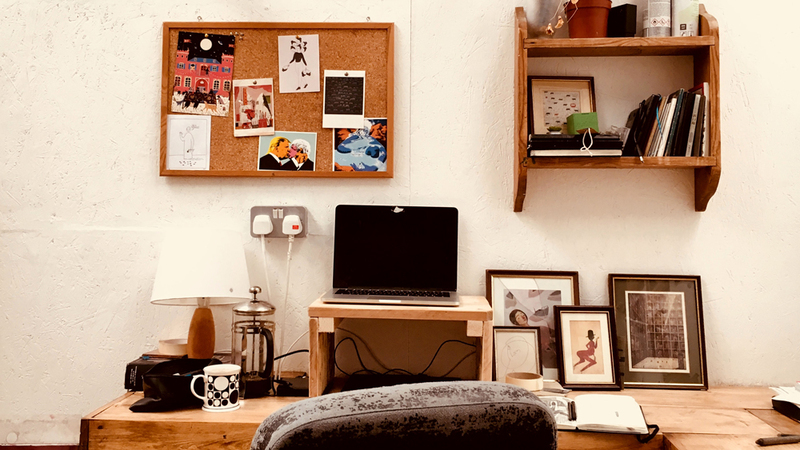 After graduating from Falmouth University with a First Class Degree in 2013, he has since been working commercially in editorial and literary illustration. His work explores challenging and thoughtful themes, with particular attention to creating atmosphere and mood. He uses a combination of traditional and digital methods, with heavy use of texture to evoke feelings of nostalgia and warmth. What tools (digital or not!) do you use to create your work? What does a typical day look like for you? Early-rise, big breakfast and a long cycle across Bristol to my studio down south. I like to dedicate a good chunk of my mornings to doodling, experimenting and generally just having a bit of a play before settling into any projects or pieces I’ve got going on. On a good day, a cafetiere of strong coffee will keep me working till late. Then home, rinse and repeat. What do you do when you have a creative block? Doodle! I tend to get creative block when I’m starting to over-think an idea, so it’s enormously helpful to let my mind (and pencil) wander for a bit when I hit a wall.. I also try to look through old sketchbooks and scribbles to see if I can find a thread to follow on from. It’s hard to make a good idea pop up out of nowhere, sometimes you need to get things trickling before you can get into a good flow. Do you have any tips for artists thinking of doing freelance? Working on a commission is the easy part, the hard (and most important) part is the space between them. I think it’s in these gaps that it’s most important to think about exactly what kind of work you want to get paid to do, and then do as much of it as possible. Someone I know used to use the phrase ‘no day without a line’; I’d be lying if I said I kept to that, but never underestimate how useful it is to keep yourself drawing (if only for 5 minutes) every day!